Diamond Whetstone™, Dia-Sharp® and DuoSharp® benchstones give you high performance sharpening with interrupted and continuous surfaces in a broad range of sizes. 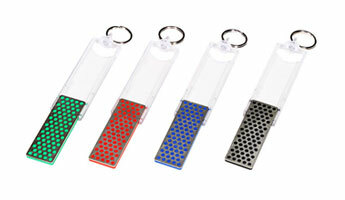 DMT® folding sharpeners are very easy to use. Compact sharpeners for the toolbox, tackle box, home or on-the-go. 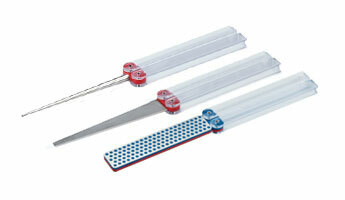 Folding models are available in a wide range of diamond grits and can handle any edge. For professional edge-care results, DMT® offers the Aligner™ Easy Edge-Guided Sharpening System producing the ultimate in fast, accurate knife sharpening. This two-grit folding sharpener is compact and easy to use. Available in four grit combinations for maximum versatility. A continuous diamond surface assures consistent, even sharpening every time. Available in a wide range of grits. This 10" x 4" two-sided stone is the largest sharpener DMT® makes. The included base keeps the stone secure on your work surface. A beautiful hardwood box contains three 6" x 2" diamond stones in extra-fine, fine and coarse grits. A great gift idea! 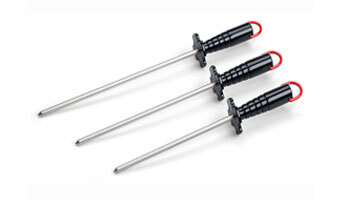 Great for sharpening on the go! 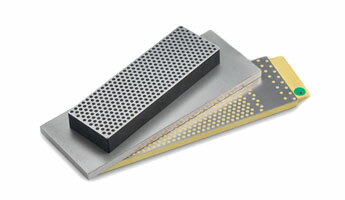 This three-grit (extra-fine, fine and coarse) diamond sharpening kit easily fits in a pocket or wallet. This easy-to-use system provides the components for guided strokes, exact edge bevel and consistent angles every time.